The wind still howls through the Catawba Valley, along the shoals of the Watauga and Broad rivers. October colors still melt in a palette of red, yellow, and orange as they did 230 years ago. 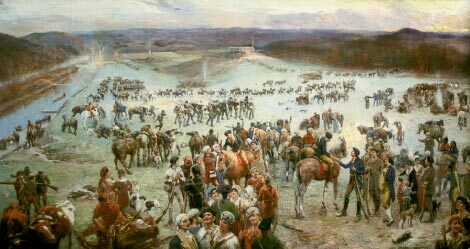 And the record of endurance required to make it through this rough backcountry to the battle that, as some say, saved the colonies from the British is no less incredible: More than 1,000 men marched 330 miles in 13 days, through rain and early snow. Sleeping under tents or trees, or not at all, the Overmountain Men kept their gunpowder dry, while they were soaked to the skin—emerging at the foothills to face one of King George’s most successful fighting forces in the South. 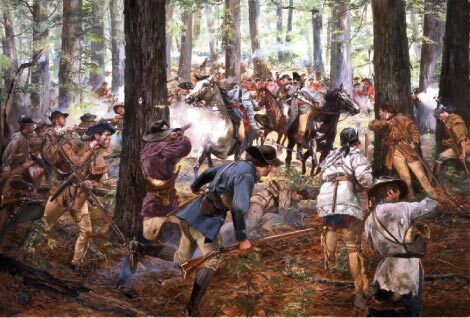 The rough edges and gutty purpose of these early Americans, who won the Battle of Kings Mountain and likely changed the outcome of the Revolutionary War, are harder to imagine. But it was desperate intention, as enduring as anything that ever happened in the Carolinas, that drove them in the autumn of 1780.
Who were these men? To be sure, they were woodsmen, as adept on foot as on horseback, professional hunters who had to be excellent marksmen. One observer called them “volunteers without wages or rations.” Everything from their supplies and horses to their gunpowder and lead had to be procured or stolen from the enemy. Most of the Overmountain Men were Scots-Irish immigrants, who had pushed the fringe of the Western Frontier, fought Indians for their settlements, and didn’t take threats to their livelihoods lightly. They were Clevelands and McDowells, Morgans and Davies, Shelbys and Seviers, all names later chosen for cities, towns and counties in and around Western North Carolina. There were other familiar monikers among the troops, including Ingle, Gwaltney, and Vance. Davy Crockett’s father fought at Kings Mountain, as did Robert E. Lee’s. Their names still echo across the mountains, and beyond. THE YEAR 1780 brought misery and war across the South. The British army held Savannah and Augusta, Georgia, and laid siege to the biggest prize, Charleston, South Carolina. General Benjamin Lincoln, torn between escape and defending Charleston, did nothing until Sir Henry Clinton was lobbing artillery at the city. It fell May 12, and with it a fifth of George Washington’s army, some 2,000 men, including most of North Carolina’s trained Continentals. It was the worst Patriot defeat of the war. Then news of a devastating loss at Camden, South Carolina, and the stalemate at Ninety-six in Greenwood County reached the militiamen in Virginia, North Carolina, and what would become Tennessee. A new level of violence was coming the Patriots’ way. Lord Earl Cornwallis, a general by rank, was already in Charlotte with an unopposed army of 2,500 men. Meanwhile, a mobile band of well-armed Loyalist dragoons raided at will along the border separating the Carolinas. Meanwhile, a more bloodthirsty British commander named Banastre Tarleton, was earning an infamous reputation in the Carolinas. He had cut down more than 100 unarmed soldiers, remnants of the Continental Army from Charleston, as they tried to surrender near Waxhaws. “Tarleton’s quarter” (meaning “no mercy”) would be a rallying cry for the Overmountain Men. “They were threatened,” says Hunt Boulware, a history professor at Western Carolina University in Cullowhee, regarding the swift response of the Overmountain Men. “They weren’t going to wait for Ferguson to come to them. It was very pragmatic.” And it proved to be perfect timing, as they eventually met Ferguson at a moment of vulnerability. The Overmountain Men began marching from points north and west even before they knew where the fight would ensue. Virginians and future Tennesseans gathered at Abingdon and Sycamore Shoals in their respective territories, while officers like Elijah Clarke and Colonel Edward Lacey followed the rumors of an impending battle from Georgia and Upstate South Carolina to join the fray. The militia colonels had picked William Campbell to lead them, partly because he was the only senior officer not from North Carolina, which would stifle jealousies. Campbell also stood six-feet six-inches tall and had an unexcelled reputation for making his size and strength count in close-quarters combat. He brought the largest contingent, about 400 men. 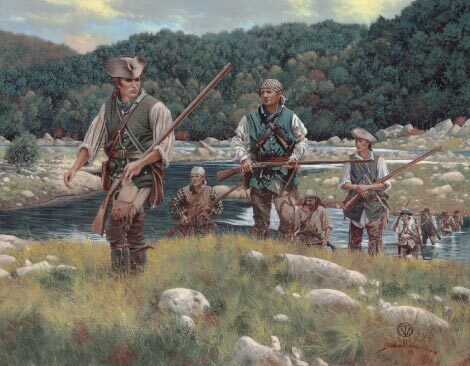 The Virginians had joined up with militias from the Wilkes-Surrey counties border area, who hiked about 80 miles along the Yadkin River to reinforce some of the Overmountain Men coming from farther north. Ferguson remained cocky, even when he learned a large force of mountain men was assembling dangerously close. Or maybe he didn’t believe that these so-called mongrels—or “backwater men,” as he preferred to call them—could organize so swiftly across rough terrain to catch him. Still, he sent riders to ask Cornwallis and Tarleton for reinforcements. None came, so he started slowly moving south from Gilbert Town. On the same day, Patriot Colonel Edward Lacey arrived at Alexander’s Ford on the Green River south of Rutherfordton with 200 militiamen from South Carolina, and a better fix on Ferguson’s position. Lacey was at first viewed with suspicion as a spy before the motley group trusted his local knowledge and headed east from the river to Kings Mountain. The Overmountain Men were stronger in number and closer to Ferguson than they expected. For reasons lost to history, the detail-conscious Ferguson dithered over preparations for a possible battle. He built nothing to restrain an attack, save organizing an arc of supply wagons as a barricade. He would defend the high ground, he thought, and no volunteer force would be able to shake him. Historians agree that Ferguson could have won the battle had any of several different strategies been employed: if he had hastened toward Charlotte and rejoined with Cornwallis; if Tarleton and his dragoons had joined the battle; or if Ferguson had chosen level ground, where the Patriots’ rifles, firing .50 caliber balls to the .75 of the British Brown Bess, would have been less effective. The terrain favored the Kentucky long rifles the Patriots carried. They were more accurate at longer range—up to 300 yards—and the trees in the area gave the Patriots shelter as they reloaded and fired. As mountains go, Kings (named for a local settler, not King George) is more of a hill, barely 60 feet above the surrounding countryside. The weather may have helped to hush the noise made by the advancing Overmountain Men, who moved through the drizzly night from Cowpens, South Carolina, to Kings Mountain, covering more than 62 miles in two days to reach Ferguson mostly undetected. The major’s pickets failed to sound the alarm, according to some accounts. No Escape Ironically, Ferguson (opposite center) invented a rear-loading rifle that could be fired many more times per minute than the Patriots’ weapons, which would have helped the Loyalists. But the King’s army refused to arm the men with the new gun. Over 1,400 strong by the time they reached Cowpens, the Patriot force would be met by at least 200 more from Georgia and South Carolina before departing for Kings Mountain. They split the force up here, bringing only the fittest group to the battle, and holding about 500 in reserve, poised to cut off a retreat by Ferguson or British reinforcements arriving from Camden in the west. On October 7, their leader, Campbell, directed the other colonels to take up flanks around Kings Mountain. There was Colonel Isaac Shelby who led men from Sullivan County, which had once been part of Virginia, and Colonel John Sevier, who brought his brother and son from Tennessee with a rough group of frontiersmen. Colonel Benjamin Cleveland had about 350 men from Wilkes and Surrey counties, and Colonel Joseph McDowell led about half that number from the foothills of the county that today bears his name. They quickly encircled the mountain. The first shot of the battle was fired at 3 p.m.
After three unsuccessful bayonet charges, Ferguson’s men were routed, caught in crossfire, and surrounded by the advancing Patriots. Ferguson took at least eight balls as he tumbled from his white horse. He wore a checkered shirt, some believe, because he was trying to escape. “He was trying to disguise himself,” says Boulware. The mountain that Ferguson thought could not be taken by a smaller army had fallen to the Patriots in little more than an hour. The Patriots captured at least 700 prisoners in a force of 1,100, nearly all of them Americans who would not fight for the King again. More than 300 of Ferguson’s soldiers were wounded or killed. The Patriot army, numbering less than 950, suffered losses of 90 (26 dead and 64 wounded). becoming a hard political sell. Ferguson was buried on the battlefield in a grave with his mistress, Virginia Sal, another casualty of the battle. Retribution followed the surrender of the British forces. In particular, James Sevier, hearing that his father had been shot in battle and his uncle had been fatally wounded, fired at unarmed Tories until he was stopped by officers. That he did, to Winnsboro, South Carolina, where he would be joined by Tarleton’s dragoons. By the year’s end, Nathanael Greene took over the Southern Army, smashing Cornwallis at Camden. Greene divided his army to fight a guerilla war, encouraging Francis Marion, the “Swamp Fox,” and Thomas Sumter, the “Gamecock,” to harass British supply lines to the east. Three months after the Kings Mountain battle, Daniel Morgan of Virginia borrowed a strategy used by Hannibal to envelop the dragoons at Cowpens and deliver, in his words, “a devil of a whipping” to Tarleton. The Patriots won another battle of attrition in North Carolina, depleting the British forces at Guilford Courthouse in March of 1781. On October 17, 1781, at Yorktown, Virginia—barely a year after Kings Mountain—Cornwallis, Tarleton, and 5,000 troops surrendered unconditionally to George Washington’s army. The war had turned on the strength and determination of the men they called mongrels. Click here for more information about Patrick Ferguson and his rifle.